* Pictures of the First Global Currency? The International Manufacturing Technology Show is held in Chicago at McCormack Place once every other year. The show focuses on the metalworking industry and is one of the largest of its kind in the world, with around 100,000 attendees expected. CNC Machinery, gages, cutting tools, and much more will be on display. We source machined parts, castings, forgings, sheet metal, and other metal parts (in addition to other products made from plastic, wood, or textiles) for our customers, and have a booth at IMTS. 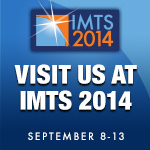 If you’re going to attend, please visit us at our booth N-6785. More information on the IMTS show is available at www.imts.com. The show runs from September 8 – 13. … the latest an order would need to be placed in order to receive it by November, is this week. An order placed today that needs 45 days for production time would be ready to ship around the first week of October. However, Chinese companies are closed the first week of October for their fall holiday, which means the shipment wouldn’t go out until the second week of that month. Depending on your location, you would receive the shipment some time the second or third week of November; maybe a little later. Ever since the mess in the Ukraine has blown up and we’ve been slapping Russia’s hand with baby sanctions, there have been rumors that Russia is trying to orchestrate agreements with other nations that will remove the US dollar from more international transactions. Forbes recently reported that the US dollar’s share of global reserves has shrunk from 72% to 61% since 2001, and that the conflict with Russia could be an “accelerator towards a more multi-currency world.” Forbes also said they thought that such a transformation might take 25 years. It was weird to see the pictures of Russia’s proposed global currency; I can’t imagine going to the grocery store and paying in a worldwide currency like this… it would feel like we’d lost our national identity.